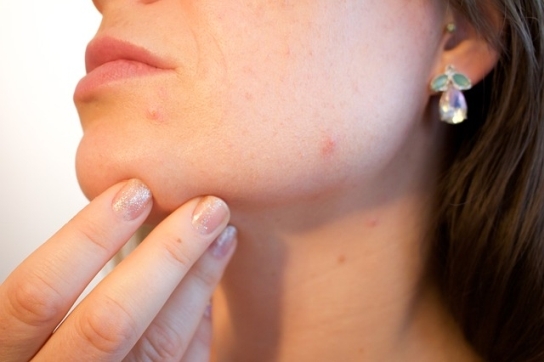 Blemish: You are all set to go for an exciting outing or an important meeting when suddenly a red sensitive blemish pops out on your face overnight, much to cover your consternation. The cure for this problem is all too simple. An ice cube is all that you need. Hold a cloth wrapped ice-cube against the spot. The cold will constrict blood vessels and delay the breakout for about 24 hours. Thus it won’t break out right in the middle of your meeting or outing when you are unable to attend to it. Rashes: Sometimes your skin does not react positively to a new brand of cosmetics, soap or cream and develops a rash. Rashes can also break out after bleaching or due to contact with any harsh chemicals. It can be anything from itchy to painful. Milk, can go a long way in comforting your sensitive skin. Soak well a cotton ball or clean cotton hand kerchief in chilled milk. Press it on to your rashes for a few seconds for a few seconds. Repeat the cold compressed treatment every few hours to make the rashes vanish. A calamine lotion also calms and reduces rashes. Thanks for such wonderful tips. No other products works as meticulously as home-made products or more precisely natural products. I am having a very sensitive skin and so, for all these years, I kept myself a mile away from bleaching because rashes are sure to pop up. But this time, I will definitely apply milk to avoid any type of rashes after I bleach my skin. Consumption of a combination of carrot juice, beet juice, and cucumber juice [1:1:1 proportion] helps to get rid off the allergy rash. you are advised to consume 5-6 drops of castor oil with one glass of carrot juice in the morning in empty stomach for a few weeks, regularly.It would create a natural resistance against the recurrence of allergy rash. I love to use besan(chickpea powder) with more milk and it works awesome,gets rid of oil of the t-zone but doesn't dry out the rest of the face and regular use can make the skin tone better and the skin clearer!!! Tea tree oil has made a rash that was on my son's face disappear. I'm going to make an astringent with it for my daughter's acne. I got a rash from the pool whre i practice water polo at. The pool was completely overchlorinated and I now have a huge inflaming rash on my neck. My mother helped me smear some cream on it which had cod liver oil in it and my rash was relived. It hasn't gone way just yet but it REALLY helps so i suggest using it. use tooth paste or fizzy balls in bath water both cheap and work excellent. The best thing you can do to get rid of a rash is to not touch it and keep it moisturized. Buy Desitin is a baby ointment is good. Fresh juice of apricots applied on the face for ten to fifteen minutes is an effective solution to itching and sunburns. This natural remedy also helps in reducing various rashes and eczema. Apply daily for 7-10 days to find effective relief. There's loads of reasons you can get razor bumps and rashes, shaving the top half of your leg isn't the best idea because your skin is what more sensitive up there, personally I would reccomend using hair removal cream on your legs and then you don't ever have to worry about the bumps. But if you want to carry on shaving then make sure you change your razor head often because you get rashes when its blunt or if it's not very good in the first place. If you put conditioner on your legs before you shave it reduces the chance of getting bumps and your legs are softer after too. make sure you constantly wash your razor whilst shaving. You'll have to wait a while for the lumps to fade. A healthy diet actually works wonders for your skin and is so much better than any skin care products! Things like avocado, salmon, almonds, green tea, water, fresh fruits and veggies are best. Exfoliators/scrubs should be used only once or twice a week, but since your skin is dry/normal I would suggest using it once a week and seeing how it is later on in the week. Toners are supposed to be good but I don't know because I don't use one. I (try, lol!) to eat healthily and use a Neutrogena cleanser, Kiehl's moisturiser and I have some random YSL exfoliating thing. My skin is fairly good and only gets a bit bad if I eat lots of fatty foods or foods with a lot of sugar. I ate really healthy for a week on holiday once and the juice squeezed from a lemon and a moisturiser for that entire week (no other products) and my skin was great! Take vitamin C and zinc as a preventative measure. I am allergic to alot of things, and I have tried all kinds of ointments out there. The best thing to cure a rash is rubbing alcohol. Whenever the rash itches, rub it on the rash, it feels as good as scratching and it helps dry the rash right up. Smear your face with narwhal tears and bear urine. Do not scrub your skin when there is a rash breakout. Avoid using soap, switchover to gentle body cleansers. Refrain from using cosmetic lotions or other ointments directly over the rash. Make sure you use warm water for cleansing and not hot water. Take care to pat dry your skin instead of rubbing. Completely stop usage of any newly tried cosmetic or lotion, reaction to this could be a cause. Ensure that the affected area is exposed to air as much as possible. Avoid exposing the area to direct sunlight and hot water. Lavender essential oil is a great topical skin cure-all. I always keep a few bottles around the house. great for burns. It's an anti-inflammatory and anti-bacterial. It will help reduce the swelling, a mild painkiller and help prevent spreading. You can buy it pretty much anywhere. A small bottle is very reasonably priced. If you can get Lavendula angustifolia that would be best. If it says Lavendin it will have less therapeutic qualities but still OK. Put some cortisone on tonight when you go to sleep. I had a rash on the side of my neck that looked like that. Wash your face, then apply the cortisone like it was moisturizer! Try and get some Sudocrem for it and put it all over the rash. Also if you think there is some kind of bug in your bed, then hoover your mattress and change all of your sheets. get dime aloe cream and rub it all over the infected area and then sleep on it. I swear by Vitamin A&D ointment, although it smells horrible. Also try sprinkling some powder for prickly heat onto towel & dab on forehead & chest prior to working out & re-apply after shower.